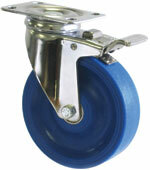 Stainless Steel casters with Kyrptonic™ wheels that have stainless steel precision ball bearings can withstand harsh chemicals, temperature extremes, dampness and wet conditions. Acorn™ offers Stainless Steel 02 Series caster rigs of all types (stainless steel stems, hole, plate, etc.) with any required option. All rigs can be fitted with wheels with stainless steel precision bearings. ﻿Load Capacity Up to 400 lbs. • Hardened steel ball bearings tough upper and lower swivel raceway on all four sides. • All moving parts are hardened to a precise molecular depth and Rockwell hardness. 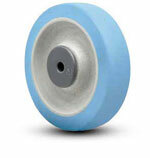 This extends caster life under rugged conditions and shock loads. 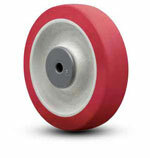 • Dust Cap Protects the raceway from contamination. • Rigid Caster utilizes a welded top plate and yoke design instead of a one-piece stamped yoke as used on competitive brands. ﻿Load Capacity Up to 325 lbs. ﻿Load Capacity Up to 330 lbs. • Available up to 880 lbs.